In short: Hybrid technology and luxury are united in this sleek SUV. 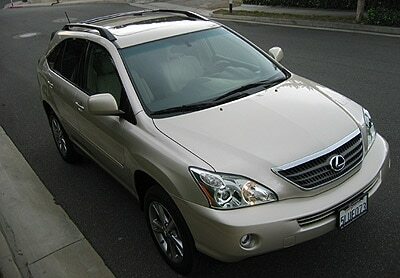 If you liked the Lexus RX series and you have a green conscience, you’re going to love the RX 400h hybrid. However, be prepared to spend $10,000 more for it than for a similarly equipped RX 330. You can choose your RX 400h to have either front-wheel drive or all-wheel drive. Simply looking at the car, it’s hard to see any differences between the regular RX 330 and the hybrid RX. Inside, the layout is the same with the exception of the rear seats, which are raised one inch for the hybrid batteries' ventilation. It's when you look at the dashboard instrumentation and start the car that you will notice that something's up. Already popular on the road, hybrids are a stepping stone in the search for alternative power sources. They are much cleaner cars and in the city use less fuel than standard gas powered vehicles. Clean diesel (sometimes bio-diesel) powered vehicles are also vying for a share of the market. However, in twenty years, things will look quite different. The RX 400h uses a Hybrid Synergy Drive system that combines a gasoline engine with an electric motor coupled with an electronically-controlled continuous transmission. This means that you do not have to plug your car in, you will get smooth accelerations, and you will benefit from the power of a V8 engine with a V6. The engine will automatically turn on and off as needed. For example, at low speeds or while stopping, the engine will typically shut off. Your gas mileage will be superior in the city with the 400h, but if you plan on letting the car sit for extended periods of time and use it mostly for highway driving, then you are better off with the RX 330. Of note, high altitude performance is increased with the hybrid as the electric motor acts a bit like a turbocharger. If you want to be in the know, a set of complicated gauges, multi-information displays and monitors can break down your driving patterns. Once you get past the subtle differences between the RX 330 and the 400h, the car feels light, fast and easy to maneuver in the city, and is most comfortable on the highway. 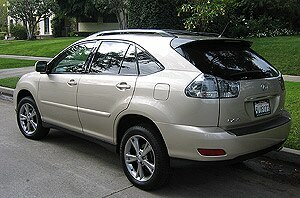 There is no doubt that the Lexus RX 400h is a great car supported by a solid reputation and a dedicated network of dealers. Now it’s up to you to figure out a way to reconcile the extra cost as compared to the RX 330. To find out more about the Lexus RX 400h, click here. Warranty/Service: 48-month/50,000-mile basic warranty, 72-month/ 70,000-mile limited powertrain coverage, 72-month/unlimited mileage rust perforation warranty. The Hybrid Vehicle System Warranty is 8-years/100,000-miles.